Today I am feeling unprecedented happiness to be able to present a Hindi edition of Sri Radha-krsna-ganoddesa-dipika to the faithful readers. The author, Srila Rupa Gosvami, is an eternal associate of Sri Saci-nandana Gaurahari, and he is the crest jewel in the community of those who relish pure bhaktirasa. This unparalleled scripture is a prominent guide that illuminates worship in the wake of the spontaneous devotional moods of Vraja. Although its language is profound, it is easy to understand. Srila Rupa Gosvami's inherent nature is superlatively sweet. He established in this world the innermost desire of Sri Caitanya, and he has written a brief yet vital description of the names, forms, qualities and different services of Sri Radha's and Sri Krsna's cherished companions. In the Brhad-bhaga, or first part, of this composition, he describes those in vatsalya- rasa and madhura-rasa, and in the Laghu-bhaga, or second part, he describes those in sakhya-rasa and dasya-rasa. Sometimes, especially in the second part, he depicts in detail the beautiful forms of Sri Radha and Sri Govinda, as well as Their bodily limbs, Their ornaments and the astonishing paraphernalia used by Them. Such a comprehensive description of Sri Krsna and His companions will not be found in any other single scripture. 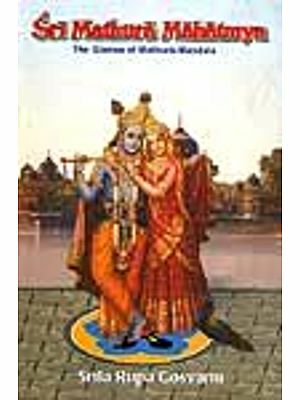 This book is entitled Sri Radha-krsna ganoddesa-dipika because it briefly introduces the dear associates (gana) of Sri Radha and Sri Krsna.! Fortunate living beings who give attention to hearing from pure rasika devotees of Vraja the transcendent narrations of the Supreme Lord's pastimes, and in whose hearts an excessive eagerness thus awakens to devotedly serve Sri Krsna in the mood of the residents of Vraja, are qualified to practise raganuga-bhakti. "What are the sweet emotions that Sri Krsna's eternally perfected associates have for Him? Is it possible that I may also attain a mood such as theirs? How can it be attained?" When the moods of the heart are characterised by this type of ardent yearning, it is symptomatic of the aforementioned excessive eagerness, or greed. service within the purified mind, it is essential to become acquainted with the eternal associates of Sri Radha and Sri Krsna and their way of performing loving service to Them. This is the information given in this literature. Thus it is not an exaggeration to pronounce this scripture as the very beacon that guides .the devotee who has already attained perfection (svarupa-siddhi), to attain complete maturity in his internal service.